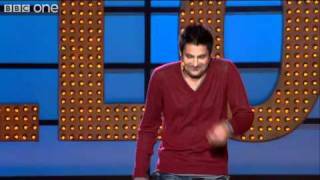 Danny Bhoy has been forced to cancel two American appearances because of delays with his visa. The Scottish stand-up was sure to perform in Denver on Thursday and at the Aspen Laff Festival in Colorado on Friday, but did not secure the right documentation in time. American authorities have been getting tougher on visas and the Aspen festival, staged at the Wheeler Opera House, also had to cancel an appearance by Canadian Jen Grant because of the same issue. ‘Visa issues have plagued us a bit this festival,’ said the venue’s director, Gram Slaton. He also suggested that the problems might affect who they book in future, saying the mess will ‘certainly inform us going into international pursuits in the future’. The US State Department advises performers to apply at least 90 days before they need to use their visa, but the process can reportedly take up to six months, Applicants can pay an extra $1,225 for a ‘premium processing service’. He will be touring Canada in March; while his place at the Aspen festival has been taken by Orny Adams, best known for his appearance on the Jerry Seinfeld documentary film Comedian.